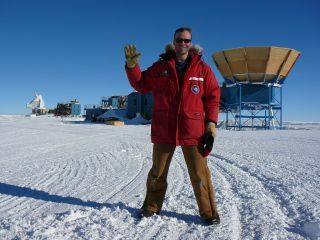 John Kovac, of the Harvard-Smithsonian Center for Astrophysics, in front of the Keck Array (right) and BICEP2 telescope (left), with the South Pole Telescope in the background (far left). On Monday (March 17), a team of astronomers sent a jolt through the physics and cosmology communities and made front-page news around the world. The researchers, led by John Kovac of the Harvard-Smithsonian Center for Astrophysics, announced that they had detected a type of polarization called "B-modes" in the cosmic microwave background (CMB), the ancient light that began saturating the universe just 380,000 years after the Big Bang. If it holds up — and most astronomers seem to think it will — the discovery opens a new window onto a realm of extreme physics and gives astronomers a much better understanding of the Big Bang and its immediate aftermath. Space.com caught up with Kovac recently to talk about the big find, its implications and what the discovery means to him and his team on a personal level. Space.com: What does this mean for astronomy and cosmology? What's the biggest implication of this find? John Kovac: Well, the B-mode signature in the CMB at the angular scales — angular scales from 1 to 5 degrees, that is — is widely regarded as the "smoking gun" signature of inflation. It's the unique prediction of inflation that we wouldn't expect to be there in the universe, according to any alternative theory. It's fundamentally built into the paradigm of inflation itself, this prediction. So, having seen a signal with our telescopes, and very clearly, and with high signal to noise, that appears to match that prediction exactly — this is by far the most direct evidence that the universe has apparently offered us that inflation is in fact correct. Space.com: How sure are you about the B-mode detection? Is there any other explanation, or is this pretty much a slam dunk? Kovac: The paper describes the statistical confidence of the measurement, and it is between five and seven sigma. That is extremely significant; the signal to noise is very high. We have for years pored over this dataset and done all kinds of internal consistency checks, and that high signal to noise allows us to slice up our data in many ways and confirm that the signal that we see is seen consistently in all parts of the data. That allows us to rule out many possible instrumental effects that one might worry about. So we've done that very carefully, and we're very confident that the signal that we're seeing is real and it's on the sky. This is probably a direct image of gravitational waves across the sky, showing us the early universe. The possibility that the B-mode signal that we're seeing is produced by a pattern of polarized dust in our own galaxy, for example, is a possibility that many people consider and are rightly concerned about. And we'll say that the data that we've got right now disfavor that explanation through multiple lines of reasoning. So we believe that by far the most likely explanation is that it is the B-mode signature from inflation, a direct image of the gravitational waves that are predicted by inflation. It's going to be controversial. We can expect that people will try to shoot at it from every direction, and we invite that — that's the scientific process, and it'll be fun and interesting. Space.com: So this detection is a smoking gun for inflation. But does it also tell us about how the inflation process occurred? Kovac: Yes, it does. There are many details, many models of inflation. But the basics of the inflationary paradigm are well-established and are universal. One of them is that the amplitude of these gravitational waves directly corresponds to how fast the universe was inflating at the time those cosmological scales were projected out of the horizon during this early process. And how fast the universe was inflating directly tells you at what energy inflation was happening. So an implication of seeing gravitational waves at the strength that we've seen them is that, yes, in fact, that is the energy scale of inflation. And another thing that is an important aspect of this that is quite fundamental is that the production of these gravitational waves during the inflationary process relies on the interaction of quantum mechanics and general relativity. It actually relies on there being gravitons, the gravitational field being quantized. And that is something of which we'd had no prior direct evidence. Space.com: So the existence of gravitons is now on solid ground as well? Kovac: Well, if gravity were not quantized somehow — and I think everybody assumes that it must be, or we don't really understand physics at all — but if it were not quantized, then you would not expect this background of gravitational waves from inflation. So it's usually a starting assumption that is built into all of these theories of inflation, but it's not something to take for granted, either. This is a point that has been highlighted by some physicists recently — that many cosmologists take this point for granted, but it is quite fundamental. Space.com: This discovery will doubtless inspire many other projects. What do you hope future experiments will do, or what do you expect them to do? Kovac: There are many experiments out there that are already very actively looking for this B-mode signal from inflation, so I'm sure it will not be long before there is follow-up, from us and from others — including from the [European Space Agency's] Planck satellite, we hope. And that follow-up will broaden the coverage and the information we have about this signal to multiple frequencies and a larger fraction of the sky, and in the process we'll be learning more about the inflationary process. As we cover a broader range of angular scales, we'll actually be tracking the evolution of inflation, the evolution of the energy scale as inflation unfolds. And that's a very exciting prospect. Space.com: On a personal note, how does it feel to be the leader of the team that makes such a potentially monumental discovery? Kovac: It's extremely exciting — many people on our team have worked for many years on this result. But we are all at this point focused on doing the most careful and correct job that we can of explaining our measurements to the scientific community, because we understand how important this is. We know that what we have is potentially very, very exciting in its implications. Space.com: Finally, what have the last few days been like for you? And were you surprised that the results made such a big splash around the world, or were you prepared to become a sort of science rock star? Kovac: Well, I must say that we appreciated how the importance of our results and their potential bearing on fundamental physics — we expected there would be news, but not this level; the response has been quite overwhelming. I'm exhausted, but it makes me appreciate (again) just how universal is our interest in the really big questions. Andrew Lange, my mentor at Caltech and a great leader of these experiments who, sadly, passed away four years ago, used to inspire people about the potential of science by posing the question, "How far can we see?" I expect he would say now that it's apparent the answer is much farther back than we once dared imagine was possible. That has captured a lot of people's imagination.